Vita Greco (known as Rita to her family and friends) was born in Newark, New Jersay, and grew up in both Newark and Irvington. With a BS degree in Business Education from Fairleigh Dickinson University, Vita taught high school for more than thirty years. She chaired the Business Education Department and Moderated both the Performing Arts and the Future Business Leaders of America Clubs. Before retiring from teaching high school, she wrote a song, which was adopted as an official 'Alma Mater'. In addition, she has authored numerous poems and lullabies for her children. She is the author of La Dolce Vita, an Italian Cookbook containing all the recipes of the food she cooks for her annual Christmas Eve Open House when she entertains at least one hundred and fifty to two hundred people (and the rest of us worry when we have a couple of frineds coming for dinner! ), and has been doing so for more than thirty years. Her newest Cookbook is Next Door to the Chicken Market, which contains more than one hundred new recipes about the Italian foods she and her family have made over the years. But what about Vita the passionate cook? Of course, being Italian (Sicilian and Vallatese / Neopolitano), I learned to cook by watching my mom. While growing up Ii would sometimes help her by starting dinner before she'd get home from work. I do like to eat, so cooking is always a joy, and I'm always looking for new recipes and new ways of preparing food. I believe that food should not only taste good, it should look good, too! I can clearly remember my parents hosting their Christmas Eve party every year with family, friends, and food galore. I have continued this tradition by inviting at least two hundred people each year and have been doing so for the past thirty-five years. And, of course, my family and I will do it again this year. I cook all the food and usually start right after Thanksgiving, because some of the foods can be frozen. Some, however, must be prepared on Christmas Eve day or only a day or two beforehand. Now, my daughter-in-law and my daughter lend a hand. One of the reasons I wrote the La Dolce Vita cookbook was to satisfy all the people who continually ask me how I prepare everything, how I organize it all, how do I make this or that, etc, etc. The book outlines all of that including all the foods I serve. Every year, however, I add one or two new dishes. When the Star Ledger newspaper advertised their contest 'Got Sauce'. to see who made the best Spaghetti Sauce or Gravy in New Jersey, I was urged to enter. I sent in a letter explaining where my recipe came from and why I believed it was the best in New Jersey. I became a finalist! When Sara Moulton and others from the Newspaper tasted all the finalists' Gravies and Sauces, they chose mine as the best in New Jersey. I call it Gravy when there's meat in it. I must say, though, that the other finalists had good-tasking gravies, too. Of course, I was thrilled when I won the constest. Sara then invited me to appear on her show, 'Cooking Live'. It was such a wonderful experience. She is a lovely lady, and everyone at the Food Network was extremely hospitable. I was a little nervous at first, but as soon as I started to cook, I forgot that I was on live television! It really was a great experience and very enjoyable. I must say that after I prepared Gravy and Macaroni, Eggplant Parmigian, and Manicotti on live television, the entire staff had a feast and ate everything immediately. I was so glad they enjoyed it all. I am a great believer in tradition and very proud of my Italian heritage. I want to keep the traditions alive for my children and grandchildren. Because of this I wrote the book Next Door to the Chicken Market. It's about growing up in an Italian neighborhood and contains all the recipes of the Italian dishes I make and much more. Now, I have been asked to do cooking demonstrations for Shop Rite and other Italian Specialty Shops, and I will be teaching two cooking classes in local Adult Schools. Winner of the Star Ledger Newspaper's 'Got Sauce' contest, Vita appeared on Sara Moulton's 'Cooking Live' on televisions Food Network. Her Pasta Gravy recipe <click here> was chosen as the 'Food Network's Choice' . . . the Best in New Jersey! Vita is active in her community by serving on the Board of Directors of her local Cultural and Heritage Committee and the Board of Directors of Mystic Vision Players, Inc. Currently, she lives in New Jersey with her husband, Tony, and her two dogs, a Yorkshire terrier named Maxwell and a wire-haired Fox terrier named Oliver. 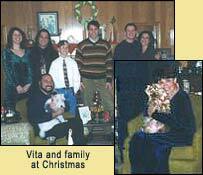 When she is not involved in doing a cooking demonstration, teaching a cooking class, or producing a show for the community theatre, Vita spends time reading or enjoying her summer cottage on the Jersey shore - sun, sand and surf with Sicilian cooking and her beloved family and pets.